Hello, my name is Jeromy, and I've been working on at Music & Arts since November of 2018. 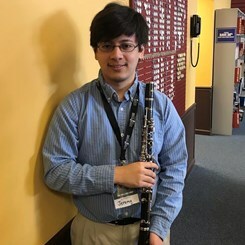 My main instrument is clarinet and I've been playing clarinet for 12 years, and have experience playing in both wind ensembles and orchestra but I have also been playing piano for over 15 years. Music has always been one of my favorite activities since I was young and look forward to continue being a salesperson here at Music and Arts!